IMHO: El Nino, et al. The Fan Hitch, Journal of the Inuit Sled Dog International, is published four times a year. It is available at no cost online at: http://thefanhitch.org. The Fan Hitch welcomes your letters, stories, comments and suggestions. The editorial staff reserves the right to edit submissions used for publication. 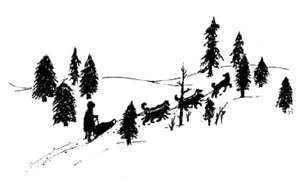 The Inuit Sled Dog International (ISDI) is a consortium of enthusiasts whose goal is the preservation of this ancient arctic breed in its purest form as a working dog. The ISDI's efforts are concentrated on restoring the pure Inuit Dog to its native habitat. The ISDI's coordinators welcome to your comments and questions. I backtracked our prints on the ground. Threat of snow I easily scented. Foot prints radiating in great profusion. "I think it's time to go HOME now!" "Let's go HOME!" (before I scream). Then focused on one narrow trail. Yet still you could not call her frail. I knew I had a safe bet. Whipping 'round turns, hidden bumps. Was a force with which to reckon. And a smile of relief - wave hello! Guides them from one place to another? Is those primitive pleistocene genes!